But suddenly, the slogans begin to change. Signposts and walls appear adorned with messages like “Welcome” and “Love for All, Hatred for None”. That is when you know you are in a village of the Ahmadiyya community. 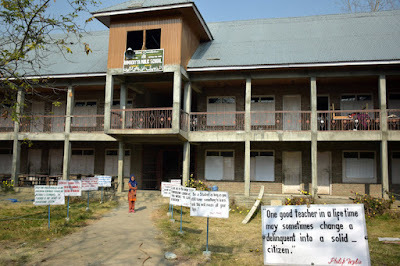 Photo: Placards, stressing the need of education and peace adorn the frontyard of a school run by the Ahmadiyya community in Reashinagar village in Shopian district of southern Kashmir (India). Good to hear that those peace loving souls are doing their part of spreading word of peaceful Islam in a very threatening situation. May God be with them always. Aameen.